The following testimonials were written by some of our happy sellers and buyers. They have all been kind enough to give us permission to show you their correspondence. Their letters and words are very gratifying and part of what has earned us the reputation we have today for being Vancouver's Most Trusted Real Estate Advisers! Sandra and Aly have helped us to purchase two homes in the past few years. They have guided us by demonstrating the best features of prospective homes along with highlighting homes needing costly repairs and updates. Their understanding of the market, the neighbourhoods, the process along with their suggestions for mortgage, legal and inspection professionals aided us through these purchases. We believe that they negotiated great deals for us and I often suggest their services to friends and family. When my wife and I were selling our home, we felt some fear that we wouldn’t be able to find the right real estate agent. We wanted someone who would not only help us and treat us well, but also someone who would help us save some money on the usual high commission that agents tend to charge. 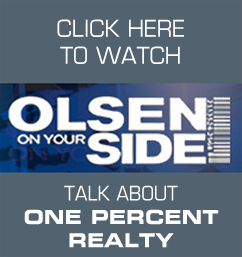 We took a chance and called up Aly and Sandra from OnePercent Realty and they exceeded our expectations! Not only did we save money on the commission, but Aly and Sandra also helped us stage our home in such a way that we sold for far above the asking price. The price we received for our condo actually set a high record for sales in our building! We have found the only real estate agents we’ll ever need! We can not recommend Aly and Sandra highly enough. They really do put in the extra effort that you hope to get. How would you profile a real estate agent that you were 100% satisfied with? Let us introduce to you Sandra Cohen who recently sold our condominium in 3 weeks. We got our price and at the same time she was dealing with the buyer and managed to do justice to both ourselves and the buyer. She is gracious, motivated, reliable, enthusiastic, but most of all has the interest of her client(s) at heart. She put first and foremost the needs and desires of her client. We were a bit reticent in choosing a 1% Realtor, but Aly totally came through for us in selling our Yaletown condo within about 3 weeks of us listing. He was very enthusiastic, knowledgeable, had a solid marketing plan and always had a professional approach in his dealings with us. He was always willing to listen, responded promptly to questions, kept us in the loop on progress and provided his advice all the way till the buyers took possession. Bottom line, we saved on commissions while getting awesome service. We would definitely recommend Aly. After selling two properties and purchasing one with Sandra, I can say she has always performed far beyond my expectations! Both my properties sold after the first open house weekend, after receiving multiple offers and for above the asking price! On the purchase of my last property, she patiently put up with my demands and worked tirelessly to find me exactly what I was interested in buying. And in the very hot and fast paced downtown Vancouver market, she negotiated a winning offer on my behalf such that 6 months later it turned into a $50K profit! I have recommended Sandra to friends looking to buy & sell real estate and absolutely everyone has been very impressed with her service, the results they've obtained and all the money they've saved. In summary, entrusting Sandra with my real estates listings has translated into making an experience, which is usually an agony, into a quick and trouble free dream. Working with her has only represented RESULTS to me. What else could anyone ask for?!?! Our experience with a 1% Realtor was that despite the significant commission savings, the service provided was no different to that of any other realtor in terms of the involvement in the business transaction and the work Sandra did. Sandra marketed our unit by means of weekend open houses, newspaper ads and extensive online exposure. She was always enthusiastic and personally sensitive with us while establishing excellent rapport with other realtors and prospect buyers. Through out the whole process we appreciated the way she answered all our questions and concerns in a timely and knowledgeable manner. We felt that she kept us well informed about the progress of the sale and valued her involvement right up until possession. She even went that extra mile and continued actively marketing our unit after we had an accepted offer subject to the buyer's sale of their own property. Bottom line, Sandra did a terrific job of handling the sale of our condo, not to mention how much money we saved in realtor's commission. We would refer her with no hesitation to anybody buying or selling real estate.